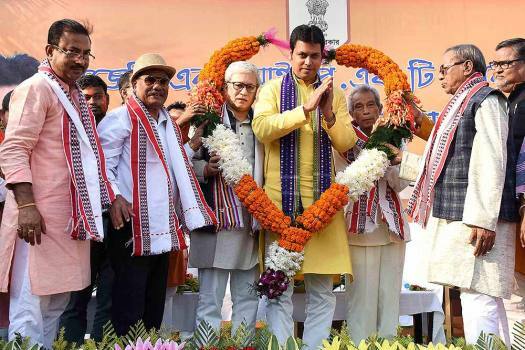 BJP-IPFT supporters garland Tripura chief Minister Biplab Deb as they celebrate the completion of one year of BJP government, in Agartala. 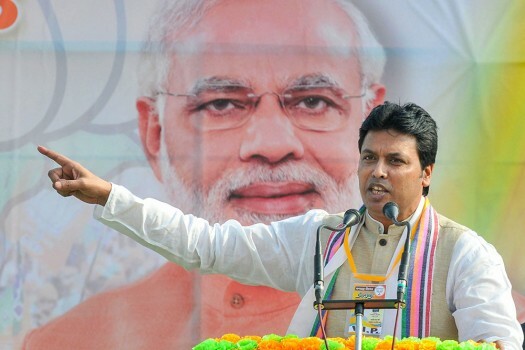 Tripura Chief Minister Biplab Kumar Deb addresses a rally, at Arambagh in Hooghly. 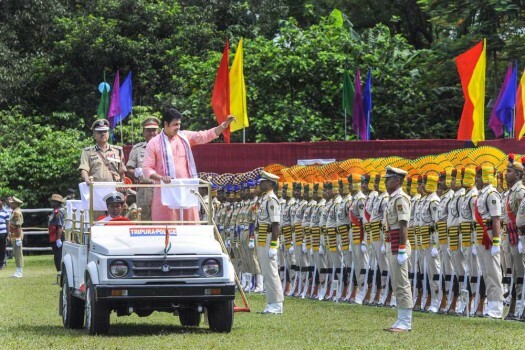 Tripura Chief Minister Biplab Deb reviews the parade during the Police Week Parade-2019, in Agartala. 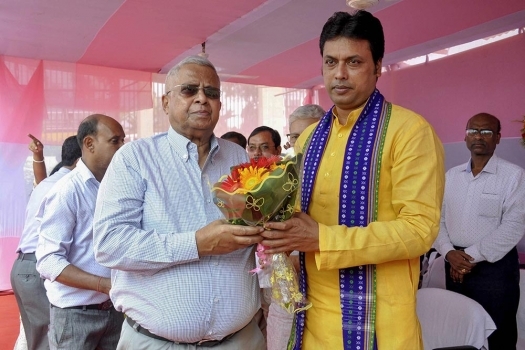 Tripura Chief Minister Biplab Deb with ace gymnast Dipa Karmakar and her coach Bishweshwar Nandi (L) releases a book on New Year's eve in Agartala. 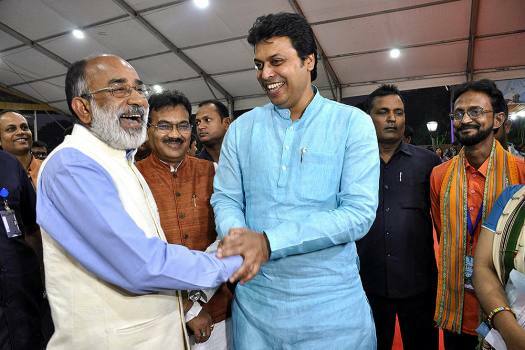 Tripura Chief Minister Biplab Deb interacts with the Union Tourism Minister Alphons Kannanthanam during the inauguration of 7th International Tourism Mart (ITM), in Agartala. 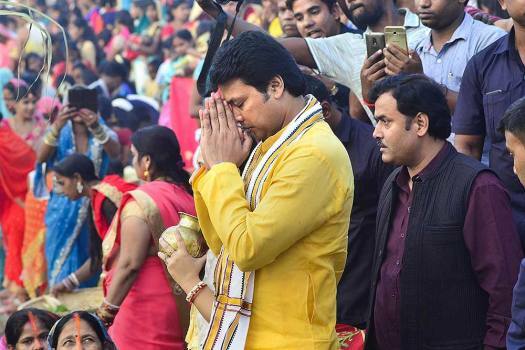 Tripura Chief Minister Biplab Kumar Deb offer prayers during the Chhat Puja at a pool in Agartala. 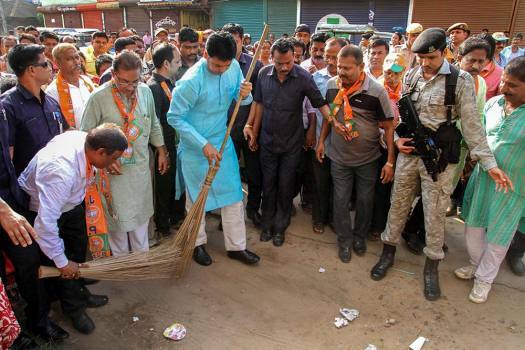 Tripura Chief Minister Biplab Kumar Deb takes part in a 'Swachh Bharat Abhiyan' cleaning campaign on Prime Minister Narendra Modi's birthday, in Agartala. 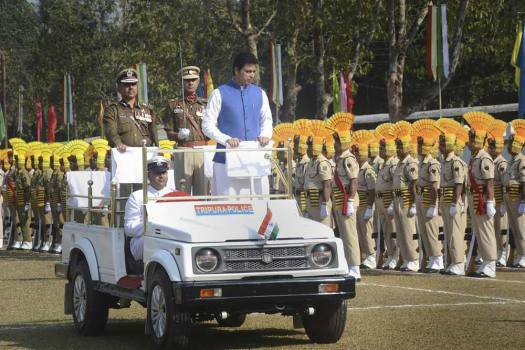 Tripura Chief Minister Biplab Kumar Deb inspects the parade during 72nd Independence Day celebrations, in Agartala. 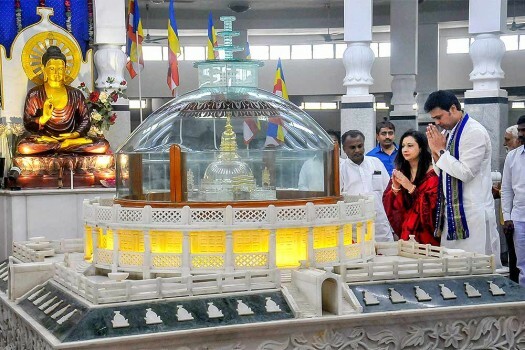 Tripura Chief Minister Biplab Kumar Deb and his wife Niti Deb pay tribute to Dr Bhimrao Ambedkar during his visit at Deekshabhoomi, in Nagpur. 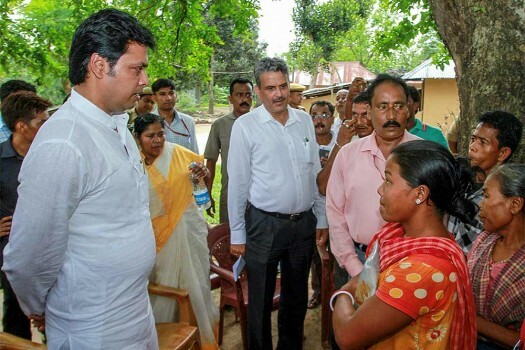 Tripura Chief Minister Biplab Kumar Deb speaks with a villager in Sunamura. 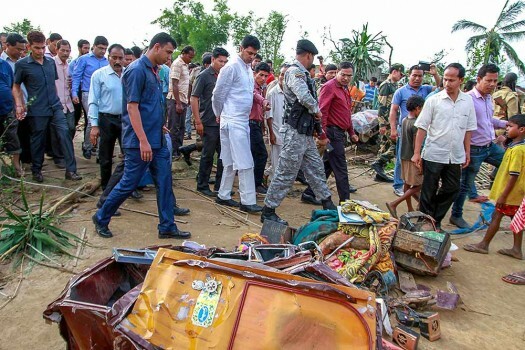 Tripura Chief Minister Biplab Kumar Deb with officials visits the cyclone-affected areas, at Belchharra village at Khowai district of Tripura. 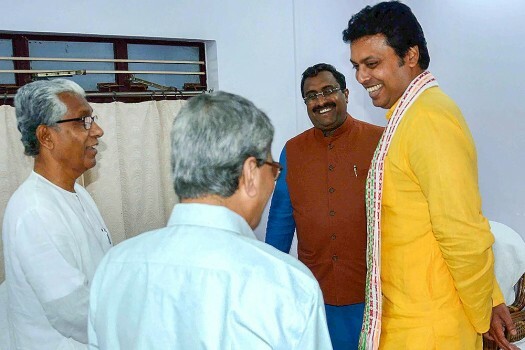 Tripura Chief Minister Biplab Kumar Deb, flanked by Deputy Chief Minister Jishnu Debbarma and Pro-tem speaker Ratan Chakraborty after an oath-taking ceremony in Agartala. 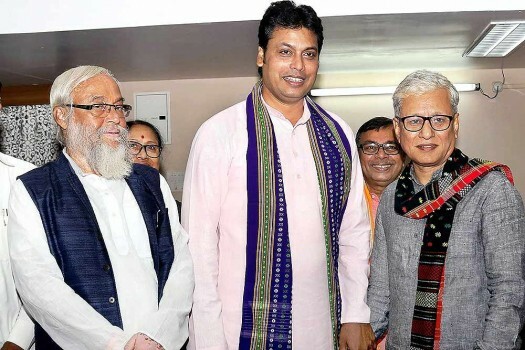 Newly Elect Tripura Chief Minister Biplab Kumar Deb meet former Tripura chief Minister Manik Sarkar in Agartala. 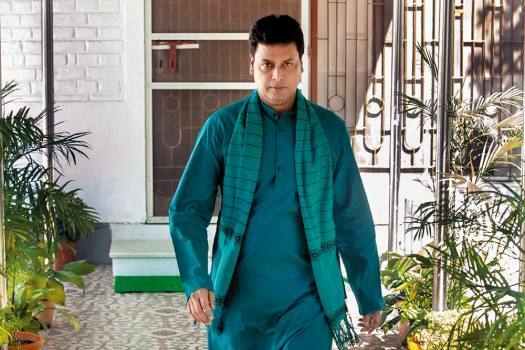 Tripura Pradesh Congress vice-president Tapas Dey claimed that BJP activists were threatening voters to not go to the polling stations and were attacking Congress workers and candidates. 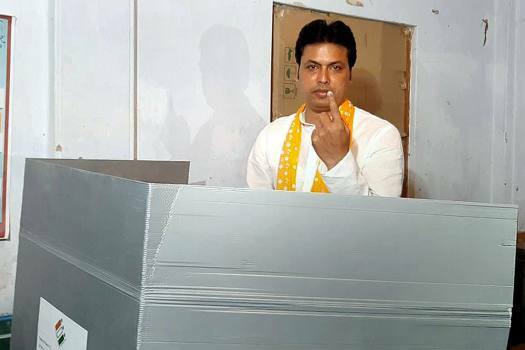 Bringing in the reference of widespread violence in last panchayat polls in West Bengal, Deb said not a single incident of violence was reported during the Tripura panchayat polls. "The communists want to choke the peoples' voice and mislead them," he said. Deb claimed his government has done justice by granting holiday on May Day only for workers in the industrial sector. 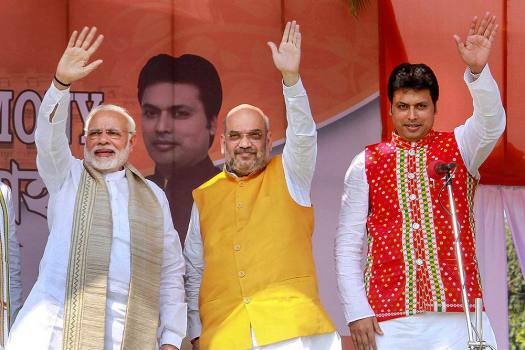 "Today I am announcing that I will start domestication of cows at the CM residence along with my family and will consume its milk. 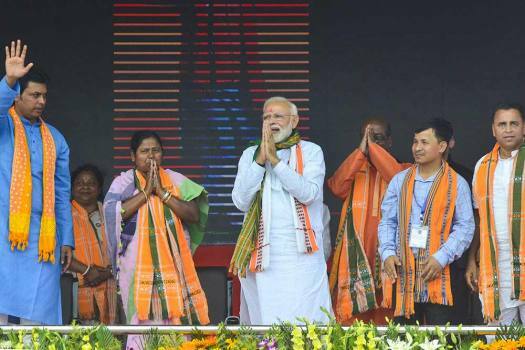 This will also inspire people of Tripura to do the same and would help fight malnutrition," Deb said. The Supreme Court-monitored update of the NRC is an exercise to identify genuine Indian nationals living in the state of Assam. In past too, Deb has made startling statements inviting ridicule and mocking. 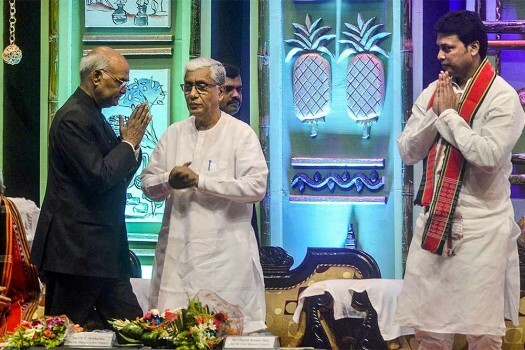 On Monday, Dev said that he would distribute as many as 50,000 indigenous ducks to people living close to water bodies, stating that ducks will add to the aesthetic beauty and help increase the oxygen levels in the water. 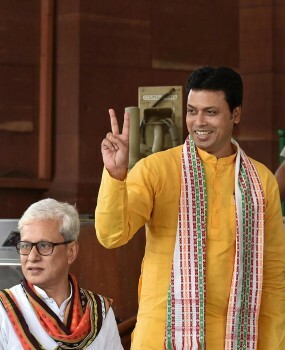 The chief minister said the Tripura government was planning to distribute 50,000 ducklings to villagers whose homes are near water bodies.